The seal of the State shall be a shield, argent, charged with a pine tree (americana, quinis ex uno folliculo setis) with a moose (cervus alces), at the foot of it, recumbent; supporters: on dexter side, a husbandman, resting on a scythe; on sinister side, a seaman, resting on an anchor. The whole shall be surrounded by a crest, the North Star. The motto, in small Roman capitals, shall be in a label interposed between the shield and crest, viz. : -- DIRIGO. 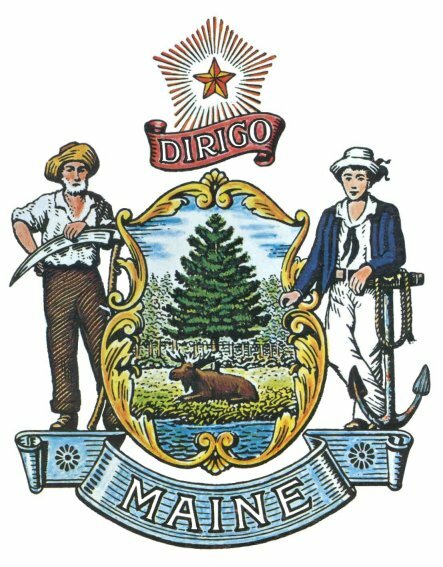 Maine became a state on March 15, 1820 and the Legislature adopted the language governing the Seal's design on June 9. The description had been drafted by a short-lived Committee under the direction of first Senate President William Moody. Colonel Isaac G. Reed of Waldoboro is credited with the Seal's description and explanation. Note the archaic language in the above statute, still alive in Maine law; the Latin phrase for the pine tree derives from a classification system no longer used by botanists, for example. The actual appearance of the Seal has varied over the years. All of the variations have been based on the language above. The first sketch of the Seal was markedly different from the above; the "moose" looked like a deer, the shield was more conventional, the scythe was held with the blade on the ground. Later variations included the scythe being held behind the husbandman's head, and in one case, the inexplicable substitution of a sextant for the mariner's anchor. There is little statutory guidance for coloring the Seal other than the description of the blue-background State Flag in Title 1 Section 206. The present design was fixed by the Legislature in 1919. Non-commercial use of the Seal by state agencies, on letterheads or videos for example, is unregulated. Use of the Seal for commercial purposes is governed by Title 1 Section 204 and requires permission from the Governor (1 State House Station, Augusta, ME 04333-0001 or by e-mail).